Hindu rituals in Bengal depict two types of cyclic event, and the onus of performing and popularizing them rests primarily on the womenfolk. The Hindu women are the major contributor to, and in fact, the upholder of Hindu religion that gives tremendous importance to rituals. The two types of cyclic event are either the life cycle events like birth, marriage and death or the seasonal time cycles of peninsular India. Most of the symbols are derived from the natural world, and the other from a rich tapestry of Hindu stories, legends and poetry, inherited from a centuries old civilization. When the classic puja was generally forbidden to women, she was allowed the entire field of fasts, festivals, get-togethers wherein she could uphold tradition with an entire gamut of vrats (vows or fasting). These involved the worship of particular deities, undertaken for a specific period and for a specific purpose and with specific methods, which were passed on orally. Few of the rituals required the presence of a priest; it was enough to perform a brahman bhojan, or feeding of the learned ones, at the end of the vow period. Often these rituals could be turned into well-attended events or practiced in solitude. Different rituals address different concerns of a woman. Her role within the household, as daughter, sister, wife and mother was well defined. Her concerns would be the general welfare of her household, of her husband and children. The rituals and fasting make her aware of the importance of taking from nature only a little of what must be taken and giving back in love and kindness, what is essential for renewal. Traditional knowledge of medicine and small process were shared by family members during the occasion. The rituals vary from region to region within Bengal. The most important ritual included on a day of a week, which was set aside as auspicious to a deity. A fast was undertaken along with reading of the legends associated with the deity. Daily Sandhya puja, first cereal feeding of a baby, marriage rituals and funeral ceremony were the important rituals in a Hindu household. 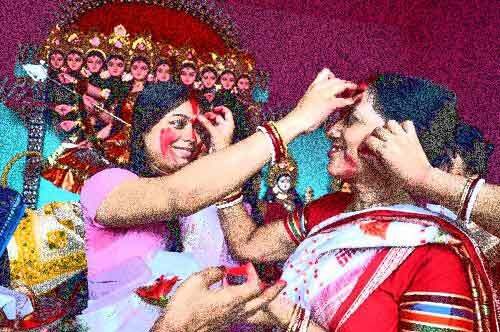 Baishakh, the first month in a Bengali calendar, begins with the Poila Baishakh and women play a very important role in the Bengali New Year festival. A number of fasts along with ritual worship are observed in the month by married women and unmarried girls. Aranya Sashti ritual is dedicated to Goddess Sashti who protects children. Mothers observe this ritual for the welfare of the children. This ritual, which falls in the Jyeshta month, is very popular throughout Bengal. The ritual also signifies the importance of forests. Goddess Sheetla is propitiated in Magh month (February). It is observed in this month as the subsequent change of season in the month of March is responsible for various diseases like chickenpox. Children are bathed in an antiseptic decoction of neem leaves and hot water on recovering from measles or chickenpox, and Goddess Shitala is invoked for the ceremony. Rituals like Jamai Sashti are very famous throughout Bengal. In this ritual, son-in-law is invited home and given a sumptuous meal by mother-in-law. Some of the modern rituals include vrat dedicated to Santoshi Mata and Shirdi Sai Baba. Tuesdays and Saturdays are dedicated to Mother Goddess Durga, the most popular deity in Bengal. She is propitiated for peace, desire fulfillment, early marriage, financial welfare and prosperity. Shravan month (July – August) is dedicated to Shiva and there are numerous rituals in the month. Monday fasting is highly auspicious. Durga Puja in Ashwin month is full of rituals and fasts. Starting from Mahalaya, Hindu women are extremely busy as there are numerous rituals during the period. Some include partial fasting to more rigorous fasting on Ashtami and Navami. Makar Sankranti is an important festival in January. In February, there is the Saraswati Puja and Maha Shivratri.